Oh my GOSH, you will fall in love with these works of art as I have! Get ready for a gush-fest as I am a huge fan of Hal Mayforth as this is not the first or the last print I have/will purchase from him! 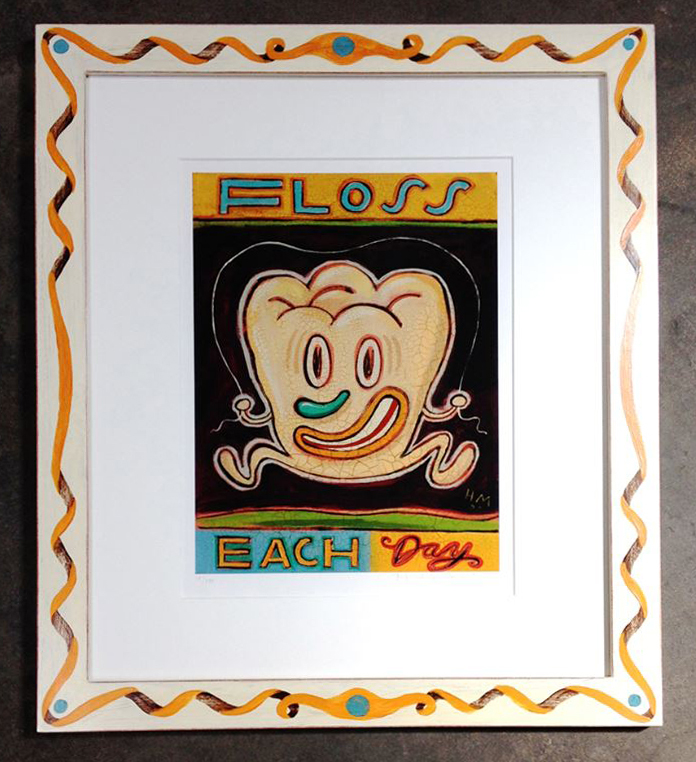 His humorous art makes me happy and brings joy to so many people! 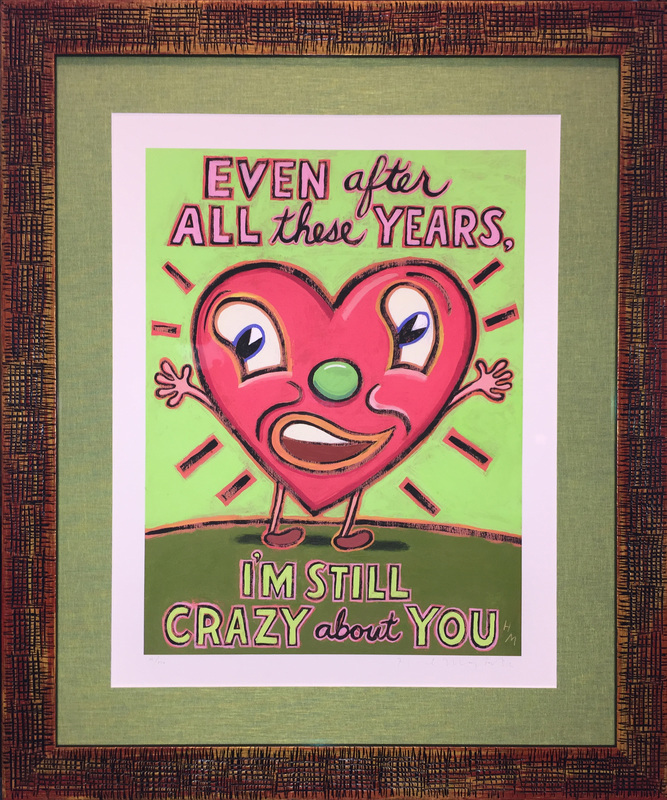 For our 17th anniversary, I bought my husband "even after all these years I'm still crazy about you". He absolutely LOVES IT! Made him laugh and smile and so happy and he said the heart character reminds him of me...lol! We are going to hang it by the steps so it's the first thing we see every morning when we go downstairs. We can start the long rat race of a day with a smile and a giggle and knowing we are in each other's corner! It is absolutely the perfect expression of our quirkiness! Not only is there so much heart in Hal Mayforth's pieces, but the quality and color on the prints are beautiful! Even more beautiful in person! They are packaged very securely and arrive safe. If you are on the fence, GO FOR IT! You won't be sorry! These pieces make me smile from ear to ear everyday, when I see them! 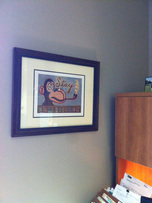 The people at the frame shop (customers and employees alike) were going GAGA over the print! Everyone who sees them goes crazy for them! Not to mention Hal's amazing personal touch of keeping in touch to make sure everything goes smoothly...so rare and so lovely! His art is fun, playful and happy. His style and humor is so unique! Just puts us in a great mood!! Thanks, Hal! We'll be back for more! ​★★★★★Your masterpieces arrived today and they're everything I hoped they would be! Thank you, thank you, thank you. ★★★★★ We have followed Hal Mayforth's cartoons over the years, seemed as if every periodical we read featured one of his quirky and humorous drawings. We came upon his website and his wide selection of originals and prints. Although it was not an easy task, we were able to narrow our favorites to three which are now hanging on our wall. We smile each time we pass them and plan to add more in the near future. ★★★★★ We ordered a print from Hal Mayforth and were extremely pleased with both the print and his conscientious communication. The print, "Please Fill my Kibblehole with People Food," is a fantastic addition to our new kitchen and reminds us everyday of why we have a dog (she makes us smile and laugh)--it also helps us to remember to feed her on time. Ridiculously cool print by Hal Mayforth. Framed in custom matched ribbon pattern with weird little details for some reason. I just received "Please Wash Your Hands". It's framed and hanging over my toilet and gives me joy every day. My favorite germ is the little worm-lookin' guy with the bulbous nose by our hero's thumb. I loved the little personal thank you note and scribble that you enclosed with the shipment. Thank you. I love my new print. I am a legal assistant and have hung this little treasure in my office at our law firm. I cannot think of a better place.......no...wait. Congress would be a better place, but that would pre-suppose enlightenment. Thank you for your intelligent whimsy!